Theredis one of the colors less used in home decoration, which is not surprising when you consider some of its drawbacks, of which I willdiscuss inmore detail below.In the rooms of the house where it is usually more present is in the rooms for children and youth, among other things because the youngest and youngest of the house red usually enchant them. 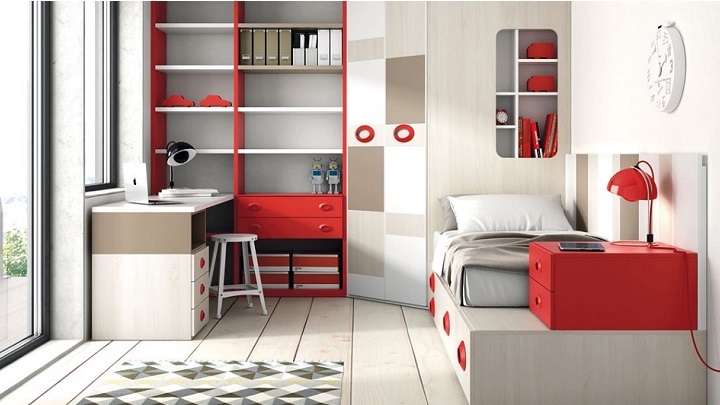 If you are thinking about decorating a children’s or juvenile’s room in red, chances are you will need some inspiration.Well, you are in the right place and at the right time, because today we are going to show you a lot ofexamples.Also, let’s give you some interesting ideas and tips.Can you come with us? Red is a color that has so many advantages as drawbacks.That is why we must use it with care.Among the good things about this color we can highlight its dynamism.In fact, thanks to him we can give a cheerful touch to the rooms of the smallest.In addition, it isunisex, so you can use it perfectly in a room shared by a boy and a girl. However, red is very intense, dominant and, used in excess, can convey a feeling ofaggressiveness.In addition, it is difficult to combine. Taking into account what we have just said, the best thing you can do when decorating a children’s room or juvenile red is to use this color in small doses.So, for example, you can choose textiles, decorative objects oraccessoriesin this color.Of course, you can also opt for red furniture, although it is preferable to choose a single piece in this color or furniture in a neutral tone that includes details in red. 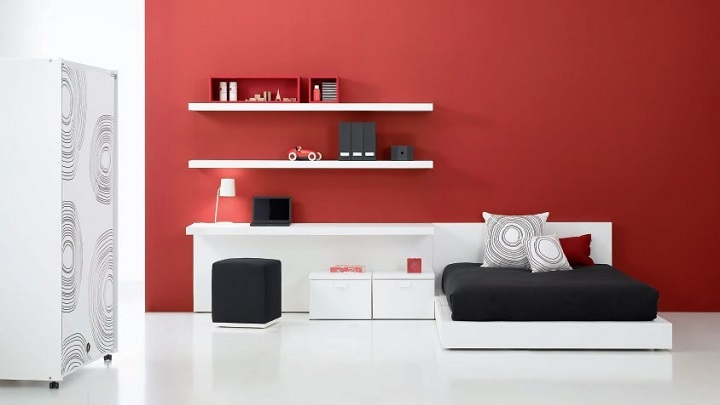 As for the walls, painting them in red is not recommended.Of course, if you like the idea, it is best to choose acleartone.It is also a good option to paint a single wall of red. 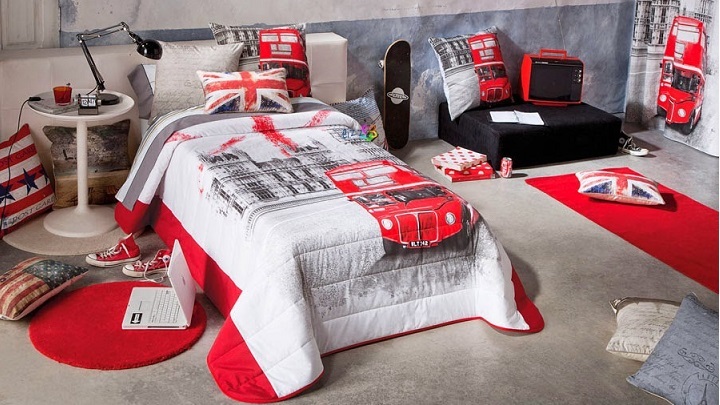 Although you can use the red in children’s and juvenile rooms of different styles, the truth is that it is highly recommended for stays of industrial style, a type of decoration that continues to have aprominent role.In the same way, it is also ideal for British air dorms, where it is also a good idea to introduce brushstrokes in blue and white. As you can check in the gallery, you can combine red in multiple ways.Of course, if you do not want to risk, the best you can do is combine it with neutral tones, which will detract from strength.In this sense, we must emphasize white and beige, two colors that enhance brightness and visual amplitude.Also, you should know that red blends seamlessly with wood and black tones. 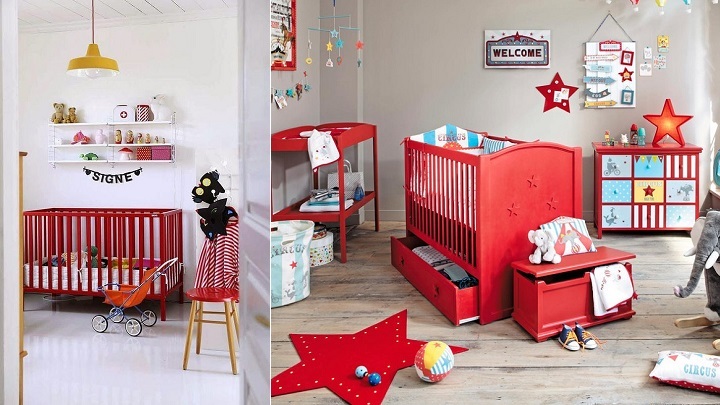 Although red is widely used in children’s and juvenile rooms, it is not widely used in baby bedrooms.In fact, as you can check for yourself by looking at our gallery, we have found few examples.However, used correctly, i.e. in small doses and / or itssofterversions, red can be as suitable as any other color, especially combined with white. ← Leather vs fabric sofas: Which is best for you?